While working on the virtualization platform system administrators usually take the snapshot of virtual machine before doing any major activity like deploying the latest patch and code. Virtual machine snapshot is a copy of virtual machine’s disk at the specific point of time. In other words we can say snapshot keeps or preserve the state and data of a virtual machine at given point of time. Where we can use VM snapshots ..? 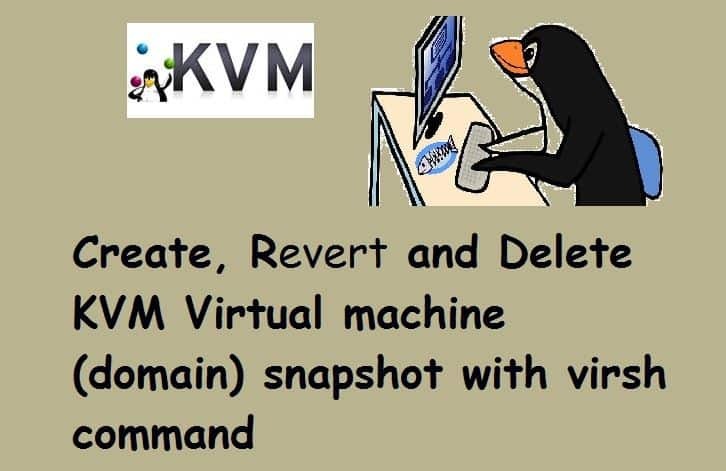 If you are working on KVM based hypervisors we can take virtual machines or domain snapshot using the virsh command. Snapshot becomes very helpful in a situation where you have installed or apply the latest patches on the VM but due to some reasons, application hosted in the VMs becomes unstable and application team wants to revert all the changes or patches. If you had taken the snapshot of the VM before applying patches then we can restore or revert the VM to its previous state using snapshot. [[email protected] ~]# virsh snapshot-create-as --domain webserver --name webserver_snap --description "snap before patch on 4Feb2018"
Thanks dude for the article. Lets say you have 3 snapshots, A B and C, taken in that order (thats C taken after B taken after A) with C as the current snapshot. If I want to delete the snapshots A and B, will the command still work. If yes, do you see potential problems of doing these?